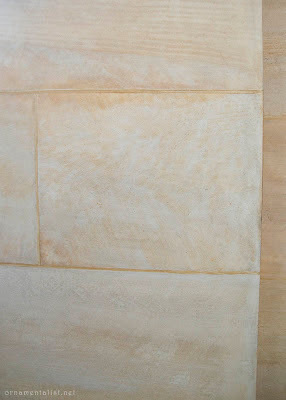 A fascinating and integral part of my work is the restoration of historic buildings, surfaces, furniture, and antiques. It's not my primary business these days, but it inspires and informs my work and the techniques I employ every day. When I travel I am excited to see the work of other restoration artisans, so I am especially thrilled to share with you my visit to the Château de Versailles, more specifically, this glimpse inside the atelier of the gilder-restorers. 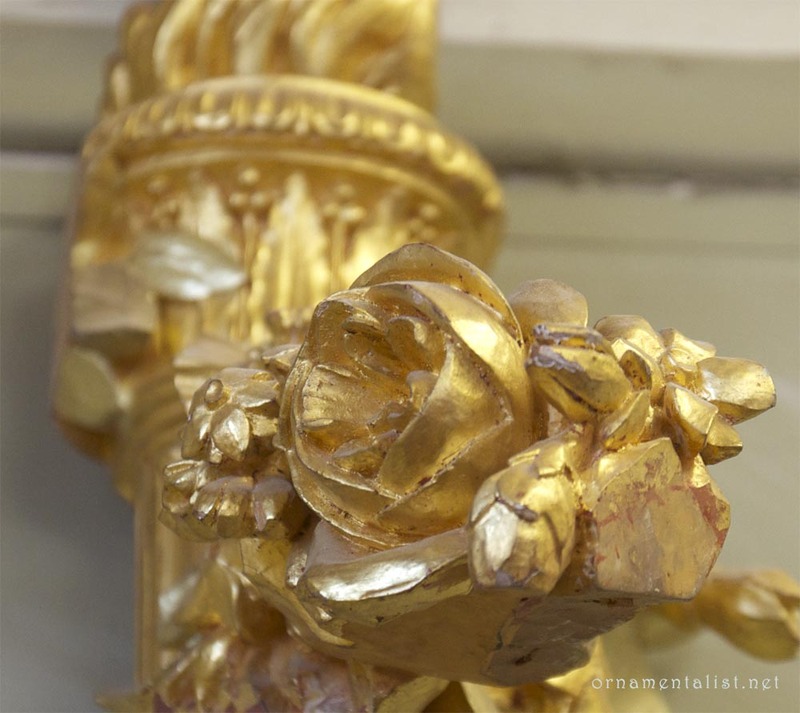 I met gilder and decorative painter Laurent Hissier via the internet, and in 2007 made a visit to Versailles to meet him and see his work at the palace. My friends and I were given a warm welcome by Laurent and his mentors, master gilder Daniel Sievert and renowned decorative painter Pierre Lefumat, and treated to a stunning backstage tour of some of the non-public parts of the palace. I felt an immediate and strong affinity for these kindred spirits; their commitment to their work is so inspiring. 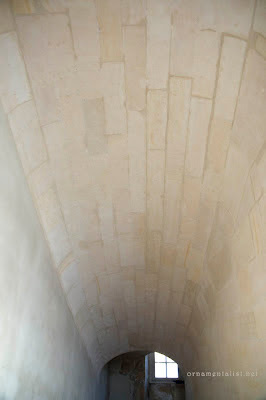 They are but a few of the nearly one thousand people working in relative anonymity to care for this spectacular palace. 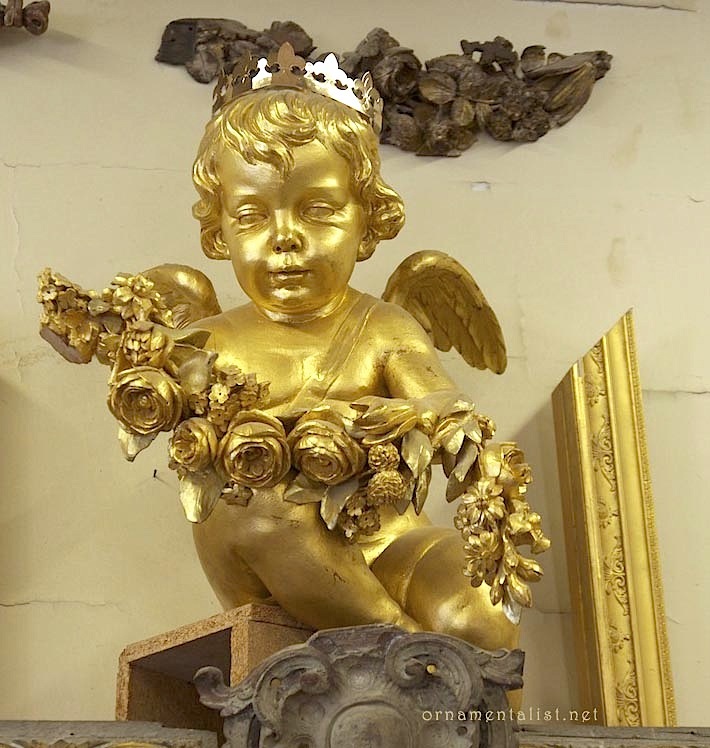 Standing in a small bedroom, in what might be called the attic, crammed with broken gilt chairs and other odd bits of furniture that are more or less priceless, Laurent remarked that this a life’s work that is never finished. This is why it is so important to pass on the knowledge. Laurent and I kept up a correspondence via email, while I anxiously anticipated the book he and Daniel were writing - the book - detailing everything they know about gilding. 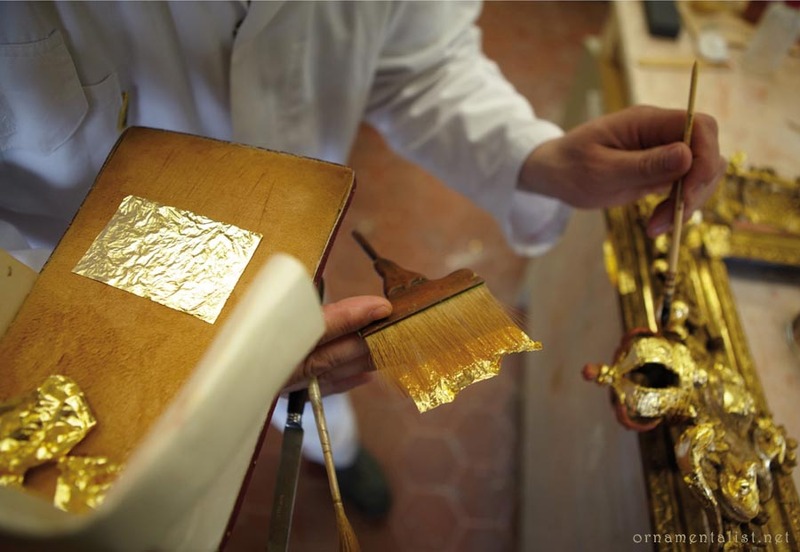 In October I visited Versailles again and called on my friends in the gilding atelier, where I was presented with a beautifully inscribed copy of Art et Techniques de la Dorure à Versailles - Gilding at Versailles! The gilding and restoration workshop is an airy, beautiful studio housed in the petite écurie, the former stables of the King. 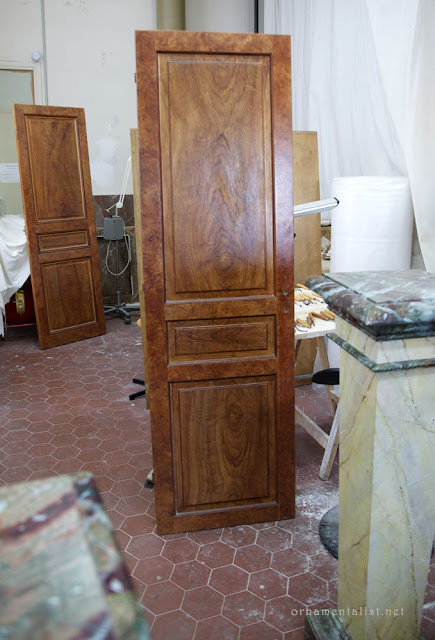 Restoration is a ceaseless effort here; restorers have access to the best materials, the support of the state, and a seemingly endless stream of thrilling projects working on priceless items of national importance. The sense of purpose and responsibility one feels there is truly awesome. 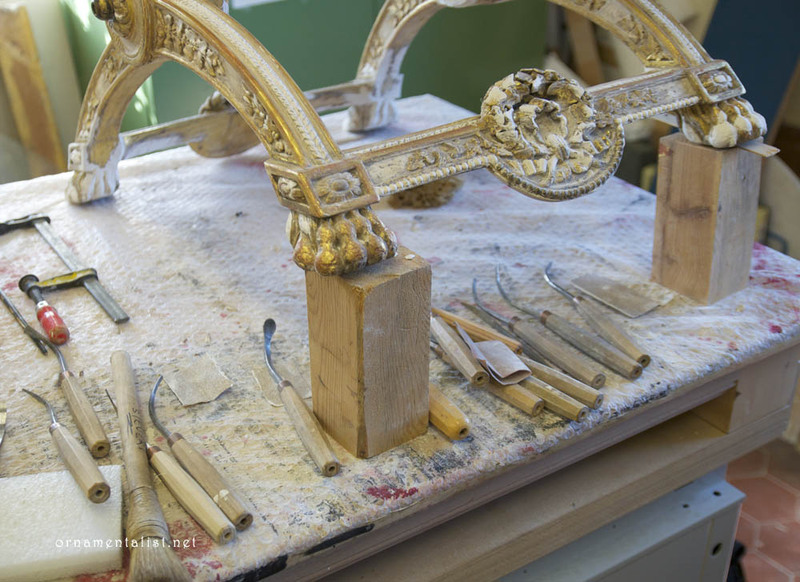 The gilder-restorers’ work is traditional in nature, with techniques passed down from teacher to student, from master to apprentice, forming an unbroken link from the creation of a piece to its renewal, and then on to the next generation of restorers to come. 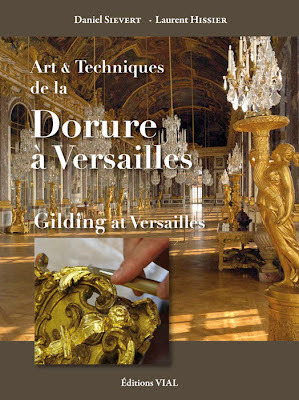 Gilding at Versailles documents this work and continues this tradition. 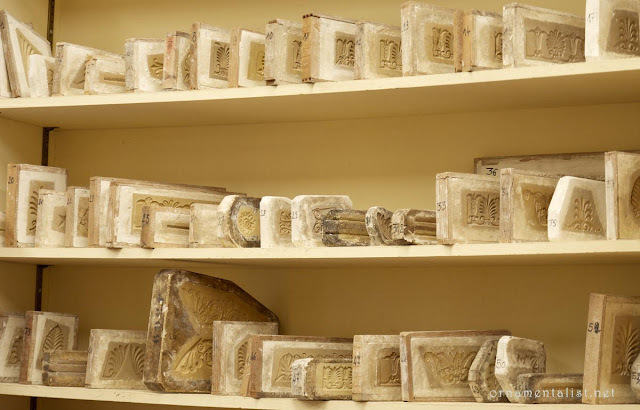 The book represents generations of accumulated knowledge from work done in the palace over the years. 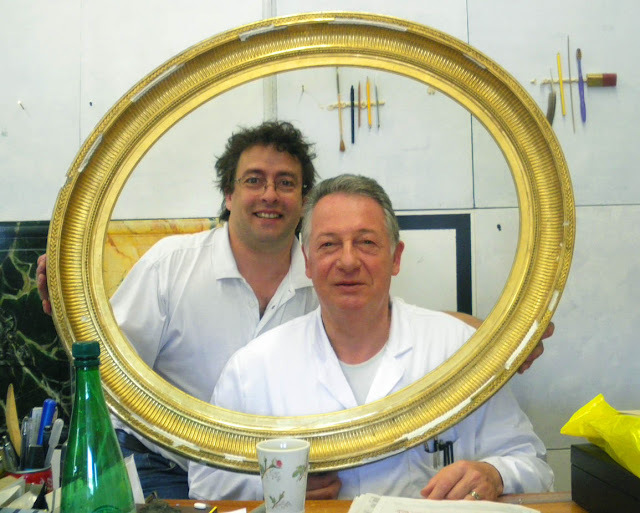 excerpt from Gilding at Versailles; phot0: Adrien Brotons: Laurent water gilding a frame. The gilders tip (brush) is being held with a hampe, or gilder's pole. The book includes instructions for how to carve your own. My colleague Ziska Childs and I had a nice visit with Daniel. Ziska is an accomplished scenic artist and designer, and having lived in Paris, she fortunately speaks French rather well. Artisans from other areas of the atelier came in to meet the visiting artists from America. We told them all how famous Daniel is. Laurent was unfortunately away that day. Where? 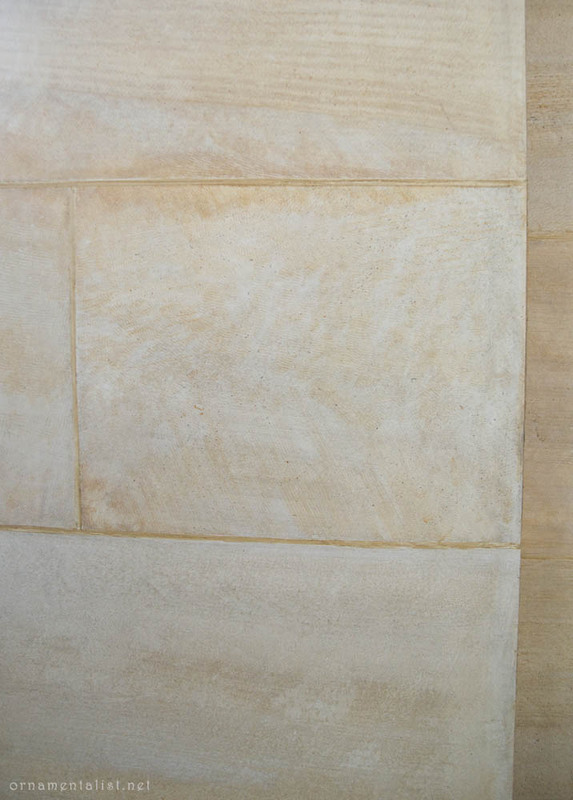 Oh, he was in Italy restoring something in the Vatican Palace. Yes I know how that sounds. It is exactly how it sounds... what a life! Master gilder and wood carver Daniel Sievert came to Versailles at the age of 14 as apprentice to Maître Grandvoinet, a master craftsman well known across France, the titular gilder of the castle. After many years working alongside his mentor, Daniel joined the CTFDU Compagnons du Tour de France des Devoirs Unis, a French guild of craftsmen with the highest standards of training, and earned the honorable title Ile de France au cœur d’or, a true master gilder. He returned to the Versailles atelier as sculptor and restorer of bois doré (gilded wood), and in 1977 succeeded M. Granvoinet as head gilder. Laurent Hissier started working at the Château de Versailles as a night watchman, and spent many long hours studying the decorative work in the palace interior while checking for security issues. 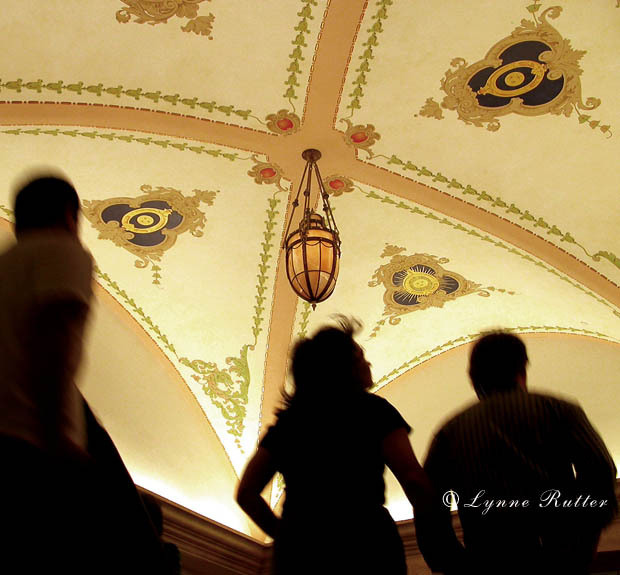 He took it upon himself to learn and practice the techniques used in the décor of the palace. 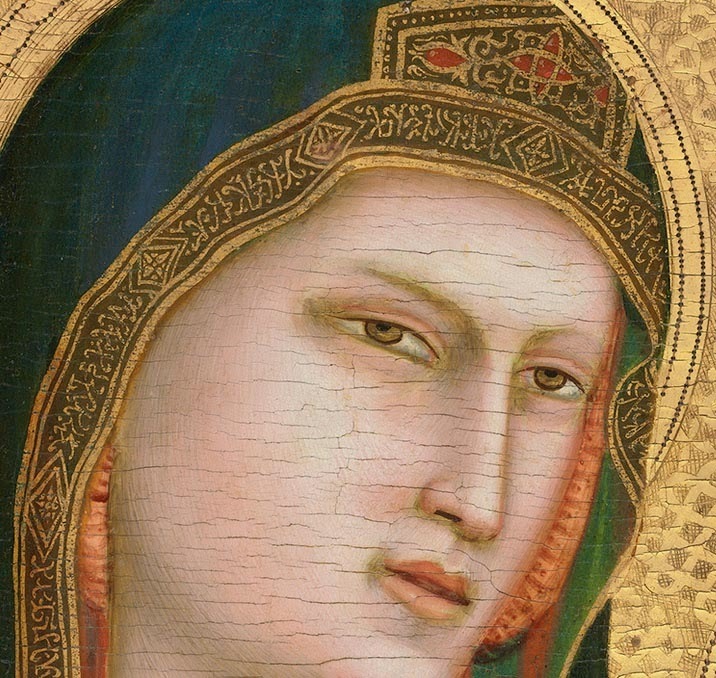 He was taught casting and molding by Yvon Bailleul in the sculpture workshop, and in 2003 was accepted into the gilder-restorer workshop, to train with Maître Sievert. Laurent also studied with Pierre Lefumat, a world-famous master of faux finishes, who taught him the techniques of faux marbre and painted finishes while working in the palace. 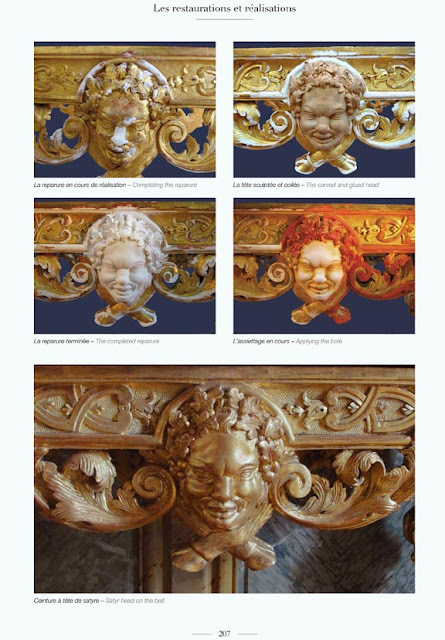 Maître Lefumat passed in 2010, a loss felt keenly by everyone at Versailles, and indeed the entire decorative painting community. Daniel Sievert retired at the end of 2011 after 52 years of dedicated service and splendid work. 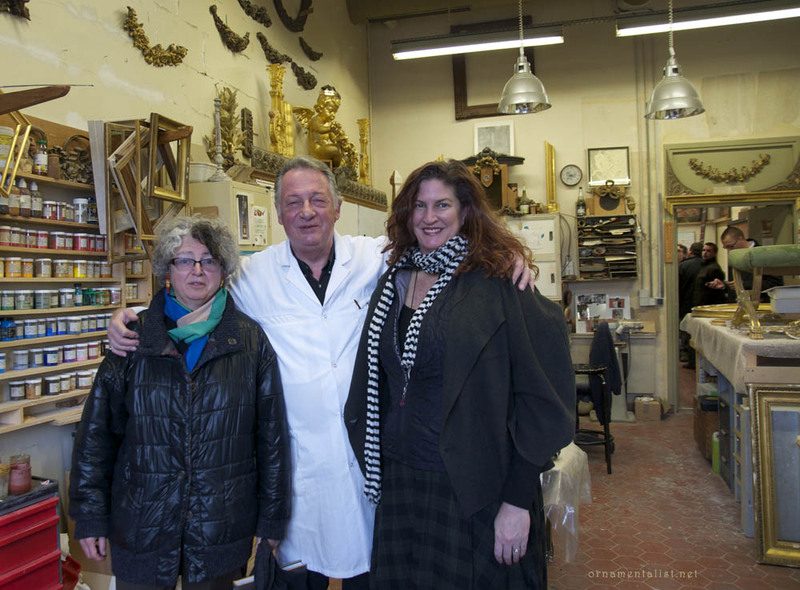 The torch has been passed to Laurent, restaurateur en bois doré et peintre en décors. After our studio visit Ziska and I toured the Palace to see some of the work of Daniel and Laurent, and Maîtres Lefumat and Grandvoinet, and all those that came before them. 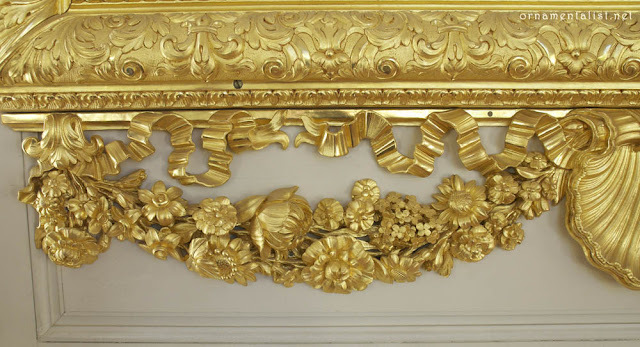 Detail of one of 24 carved limewood and gilt frames, circa 1687 (recently restored) in the Cotelle Gallery of the Grand Trianon, Versailles. Excerpts from Gilding at Versailles use with permission. You are so lucky-god i hope I get to visit there some day. I am so longing to travel to Europe again! Thanks for the photos- love all of them! Hi, Lynne - It looks as though you got the tour of a lifetime, and now I have yet another book to add to my wish list. Maybe it will be a Christmas gift to myself . . .
Mark, thanks for stopping by. The book is very technical but since the examples are all insanely fabulous antiques and the palace itself, it's a big box of eye candy. I look soooo joyous in that pic, thanks ever so for posting...(the studio is fab, and Daniel is a sweetheart) If you haven't bought the book yet, what's wrong with you? Ziska, looks like you are still in the "fro" part of "fromage" there. This whole post was eye candy for my soul! 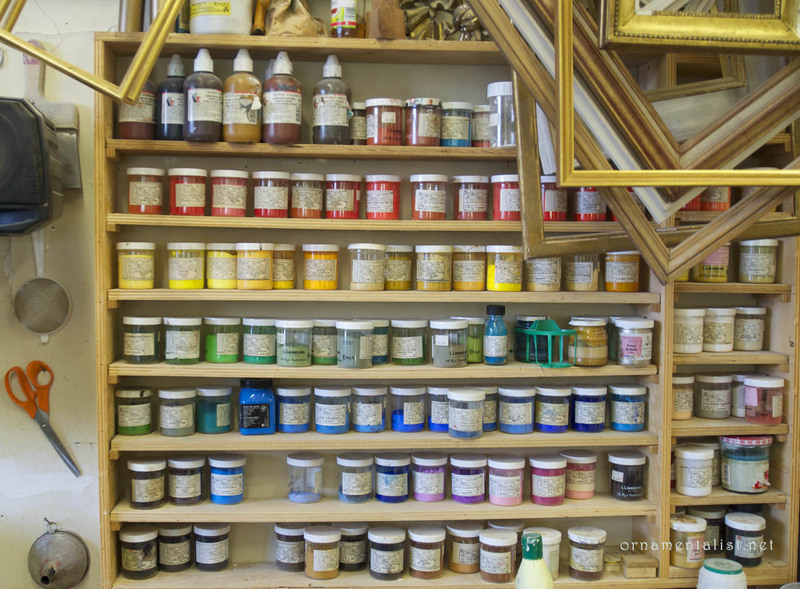 I cannot think of a more idyllic job than to work in the atelier. Thanks for sharing with us and also allowing us to see the famous Ziska Childs! What a trip you must have had!